It’s the first podcast in quite awhile and there’s plenty to talk about. 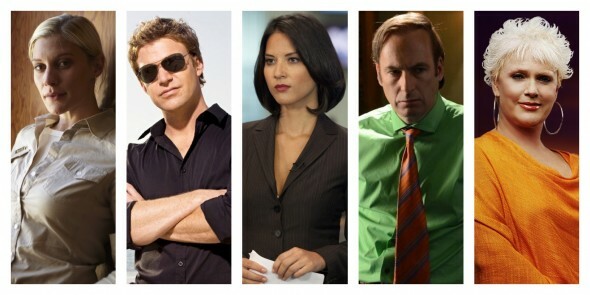 Longmire and The Newsroom have (supposedly) been renewed while The Glades and The Killing have been cancelled. True Blood is coming to an end next summer and Mad Men will close in 2015. Meanwhile, Burn Notice had its series finale while Dexter is ending this Sunday. Breaking Bad is ending in two weeks but one of the characters is sticking around. Cinemax has picked up the first season of Strike Back and it will air once season four has finished (huh?). Three new FOX shows have debuted. Did any of them crash and burn right out of the gate? All this and, the world of The Walking Dead is about to get bigger. Tune in! – Longmire renewed for season three. – The Glades cancelled after five seasons. – True Blood is coming to an end next summer. – The Newsroom will return for a third season. – Cinemax will air Strike Back: Origins. – AMC’s The Killing has been cancelled for a second time. – The final season of Mad Men will be broken up into two parts. – New FOX shows Sleepy Hollow, Dads, and Brooklyn Nine-Nine have premiered. – Dexter is ending this Sunday night. – Breaking Bad is ending on September 29th.